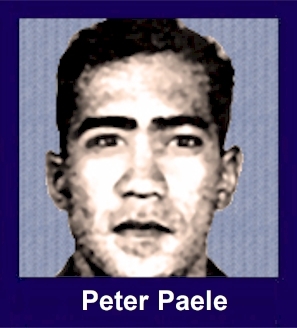 The 35th Infantry Regiment Association salutes our fallen brother, SGT Peter James Paele, who died in the service of his country on October 21st, 1967 in Quang Tin Province, Vietnam. The cause of death was listed as Small Arms/AW. At the time of his death Peter was 32 years of age. He was from Kahului, Hawaii. Peter is honored on the Vietnam Veterans Memorial at Panel 28E, Line 46. The decorations earned by SGT Peter James Paele include: the Combat Infantryman Badge, the Bronze Star with V, the Purple Heart, the National Defense Service Medal, the Vietnam Service Medal, the Vietnam Campaign Medal and the Vietnam Cross of Gallantry with Palm Unit Citation. Sergeant Peter J Paele of Maui died in Vietnam as a result of wounds received from hostile fire while on a combat mission, according to the information office, U.S. Army Hawaii. His next-of-kin is listed as father Edward Paele Jr.; former Pauwela resident now a patient at Kula Sanatorium. He is also survived by his wife, Dorothy L Paele, and stepdaughter, Sally A Addison, both of Platte City, Missouri; as well as a sister, Mrs. Edith Torricer of Maui.